1.1.1. It is specifically derived from the theoretical branch of syntactical analysis known as ‘generative or transformational grammar´. 1.2.1. The scope of transposition is limited to the parts of speech that is, to nouns, adjectives, verbs, etc. 1.2.2. 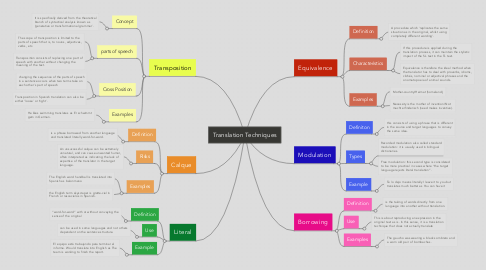 Transposition consists of replacing one part of speech with another without changing the meaning of the text. 1.3.2. Transposition in Spanish translation can also be either ‘loose´ or ‘tight´. 1.4.1. He likes swimming translates as Er schwimmt gern in German. 2.1.1. is the taking of words directly from one language into another without translation. 2.3.1. The gaucho was wearing a black sombrero and a worn old pair of bombachas. 3.2.1. can be used in some languages and not others dependent on the sentence structure. 3.3.1. El equipo está trabajando para terminar el informe. Would translate into English as The team is working to finish the report. 4.1.1. A procedure which 'replicates the same situation as in the original, whilst using completely different wording'. 4.2.1. If this procedure is applied during the translation process, it can maintain the stylistic impact of the SL text in the TL text. 4.2.2. Equivalence is therefore the ideal method when the translator has to deal with proverbs, idioms, clichés, nominal or adjectival phrases and the onomatopoeia of animal sounds. 4.3.2. Necessity is the mother of invention/Not macht erfinderisch (need makes inventive). 5.1.1. is a phrase borrowed from another language and translated literally word-for-word. 5.2.1. An unsuccessful calque can be extremely unnatural, and can cause unwanted humor, often interpreted as indicating the lack of expertise of the translator in the target language. 5.3.2. the English term skyscraper is gratte-ciel in French or rascacielos in Spanish. 6.1.1. this consists of using a phrase that is different in the source and target languages to convey the same idea. 6.2.1. Recorded modulation also called standard modulation: it is usually used in bilingual dictionaries. 6.2.2. Free modulation: this second type is considered to be more practical in cases where “the target language rejects literal translation”.